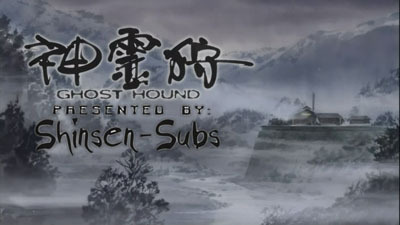 September 15, 2008 October 12, 2010 zzeroparticle 0 Comment ghost hound, Masamune Shirow, Production I.G. Synopsis: Taro Komori has had the same dream every night. It starts with him flying around until the scene transitions to a dark room abuzz with flies. The room is mostly empty save for a girl’s corpse on a bed and a boy, presumably Taro himself. This dream comes every night because Taro and his sister had been victims of a child kidnapping ten years ago and while the victims were quickly murdered, Taro was spared, but his sister was not. Something deep within his mind has caused Taro to repress that memory and it falls upon Dr. Hirata, a psychiatrist, to draw forth that memory. In the meantime, other strange events have been occurring in the small town of Suiten including sightings of spirits and monsters. Only with the help of his two classmates, Masayuki Nakajima and Makoto Ogami, will Taro finally be able to unravel the mystery and how this relates to Miyako, a mysterious girl capable of channeling spirits. Review: So have you ever watched a series that had an excellent buildup but then completely derailed towards the end? Yeah… Ghost Hound pretty much fits the bill. To see more, you can check out my review on the Nihon Review. I doubt it was that derailed. However I really liked the series for all the psychological revisions and theories that were put forth, not to mention blending it in with the horror nicely. Oh certainly. That part of the series was absolutely fantastic. I really couldn’t ask for more in that department. It’s just… the loose ends. There were too many of them. And few of them got the proper resolution they deserved. It was one of those series where ur like ok its going to get better next episode the whole series. Some parts i liked with the episodes taking pages out of psych 101 book and making an episode was tight. It did have a lot of suspense but it never really informed you at the end. Its like im still wondering wtf happend and ive finished the series. It was lets say a B- in my book, watch it if you have time to spend.